Running away to Southwest Florida is a popular pursuit every winter, especially for beachgoers and golfers. Nicknamed the “Paradise Coast,” this corner of the Sunshine State is a mecca for fans of playing in the surf and on the fairway. And while warm gulf breezes and early morning tee times are treasures for many, you may also be intrigued by the region’s fabled past of conquistadors, pirates and scoundrels of all types. Galleons laden with gold, silver, gems, pearls, spices, sugar, tobacco, exotic woods and more were on constant route to and from the Gulf of Mexico to the coast of Spain. According to lore, an entire cache of treasure intended for the Queen of Spain—including a golden jewel-studded carriage pulled by a team of gilded silver horses, 41 chests of emeralds and a 74-carat emerald ring set in gold—was lost off the coast in 1713. Ponce De Leon came to Southwest Florida on many occasions, in search of the elusive “Fountain of Youth.” The native Calusa tribe who originally settled this area fought fiercely to defend themselves from De Leon and his marauding crew. De Leon later died on his ship en route to Havana. Two notorious buccaneers fought each other on Sanibel and Captiva Islands. A fearsome pirate named Henri Caesar stole from legendary swashbuckler José Gaspar when he invaded Captiva Island, where Gaspar held wealthy Spanish prisoners for ransom. Gaspar got even by raiding Caesar’s camp on Sanibel and drove him off the island. Gaspar fled with Caesar’s treasure to a nearby key where he’d built his home, known today as Gasparilla.When his ship Floridablanca was finally sunk in Charlotte Harbor by the American Navy years later, most of José Gaspar’s crew was watching from the shore with twenty large chests of treasure they’d captured. Upon seeing their vessel vanish under water, the crew escaped with the treasure chests in longboats up the Peace River. 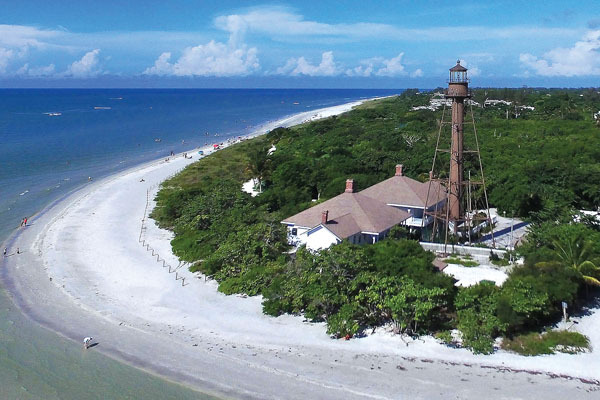 The getaway destinations of Bonita Springs, Estero and Fort Myers Beach border a scenic body of water called Estero Bay, sprinkled with mangroves and tiny islands. In 1719, infamous scallywag “Calico Jack” Rackham and his partner in piracy, Anne Bonny, were shipwrecked by a hurricane on a barrier island at Estero Bay. Rackham and Bonny erected a palm thatch hut on the island that became their private romantic escape. For that reason, it’s known as Lover’s Key. If any of these legendary, seafaring figures anchored here today, they’d likely be staying with Royal Shell Vacations. Pirates, explorers and romantics alike were experts at finding the best spots for privacy, relaxation and enjoying the bounty of the local landscape. Now, Royal Shell procures Southwest Florida’s premier private getaway accommodations for visitors like you, enhanced by five-star guest services. Whether you arrive by plane or pirate ship, want fun in the surf or on the fairway, Royal Shell promises you a vacation you’ll treasure.